Two Frenchies! Okay, Deux Frenchies! | the wine snob. Two Frenchies! Okay, Deux Frenchies! Whatever, y’all- I don’t speak French. I don’t write about French wine all that often. Not because I don’t like it- in fact, I love it. It’s just that when I truly LOVE a French wine, it is usually very- you guessed it- expensive! Of course I could write a blog about amazing wines that I’ve been fortunate enough to try (usually at trade shows or on someone else’s dime) that you, dear average reader with student loan payments, probably cannot afford- but where’s the fun in that? So that’s why it’s so exciting to me when I find great French wine that is reasonably priced! So this week I bring you not one but TWO French reds that have colored me truly impressed! 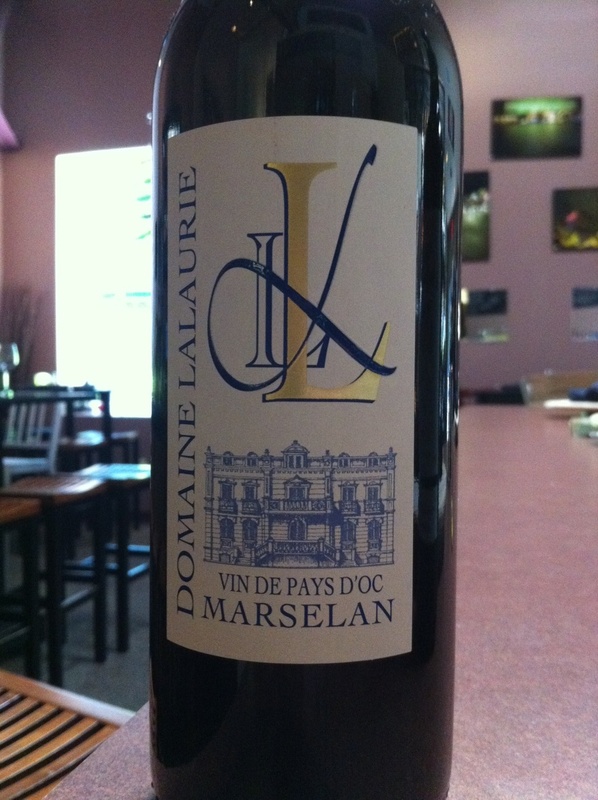 First is the Domaine LaLaurie Marselan, 2007 Vin de Pays. What on earth, you ask is MARSELAN? This is the exciting part- Marselan is a true wine baby! Not just a pretend baby that I like to imagine. Marselan is a cross between Cabernet and Grenache! How do they do it? How do they make wine babies? I’ve been told that you can literally “marry” grape vines- that is, they’ll grow together somehow… oh, I don’t know- someone told me that and I don’t really get how it works, but that person knew what they were talking about. But was Marselan more of a test tube baby? Created in a labratory? Or did they just leave the Cabernet and Grenache together in a room with a disc full of Lionel Ritchie and lots of candles? Who knows. In any case, they did sumpin’ right with this one, because I LOVE this wine! It has a nice bold nose of cigars, coffee, tobacco, vanilla, cloves, plums and a nice light oak. It has a pretty finesse, along with that awesome acidic “grip” that I love in a wine. I don’t know how else to describe it, but I love when a wine really grips the inside of your mouth <insert “that’s what she said” quote here>. I could sip this one all evening, or enjoy it with food. It’s pretty versatile- it would stand up to a a steak- maybe a grilled one with a spicy espresso-rub? That would be nice. Fall/Winter fare would be great too- roasted root veggies or roasted meats. Perfect. Speaking of Fall/Winter fare- IT’S SEPTEMBER!!! We’re almost there! The Summer is drawing to a close! Woohoooooooo! That might be a little too much enthusiasm for 9:00am on a Wednesday morning, but I guess that ‘s what happens when you taste wine before breakfast. Oops!! Okay, I’m getting a little wordy, so let’s move on to Frenchie number two! 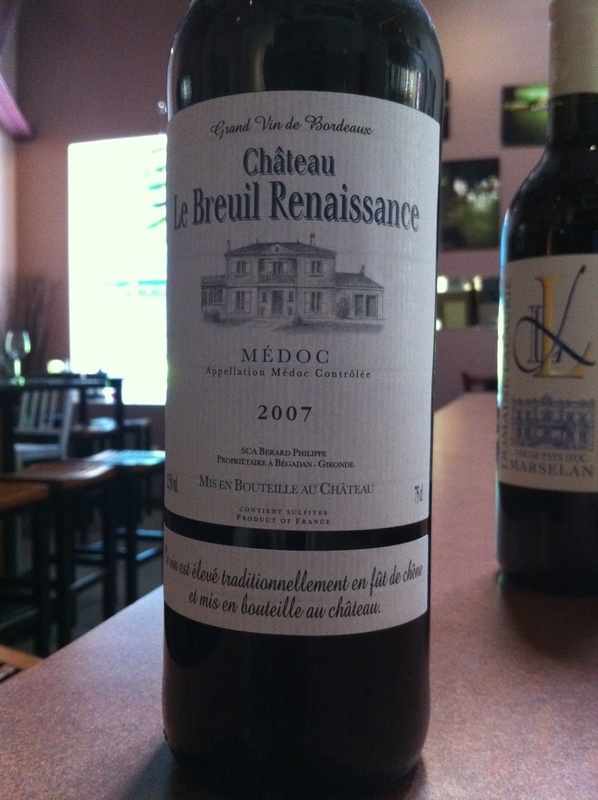 Chateau le Breuil Renaissance, 2007 Medoc (which is in the Bordeaux region). So yes, this is a Bordeaux blend. This particular one is comprised of 60% Merlot and 40% Cab. From my experience with our customers, people really WANT to like Bordeaux, they think they SHOULD like Bordeaux… but a lot of times they don’t. And they feel guilty about it, like maybe they’re missing some crucial element of wine-enjoyment. After all, wines from Bordeaux are some of the most expensive and sought after wines in the world, right? So if you fall into that category, have no fear- I believe you will like this one. It’s friendly, gentle, and pleasant. Notes of leafy cedar, light stone fruit (ie cherries), a hint of something minty- maybe spearmint, and nice earth. Despite it’s fairly earthy-crunchy exterior, this wine sips beautifully and has a very smooth, polished finish. 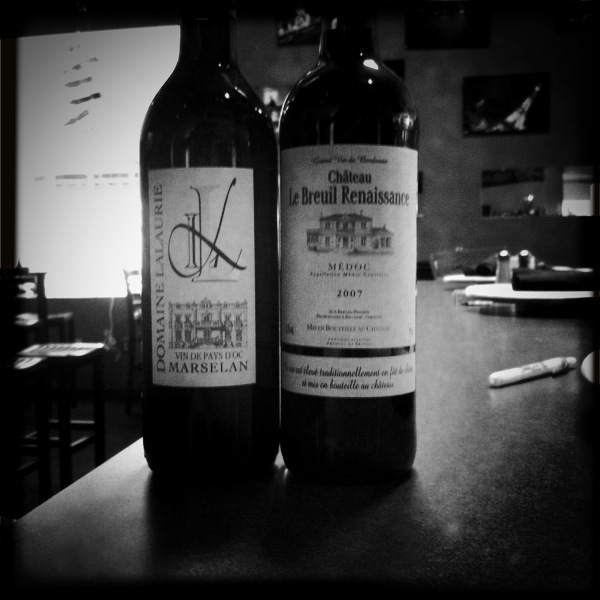 The Domaie Lalaurie retails for $13, while the Breuil Renaissance comes in at $16. Currently Lalaurie is being poured by the glass, and come tomorrow (Thursday the 2nd) so will the Renaissance! So that means you can stop by Cellar and ask for a taste any old time you want! Can’t beat that! Thanks for reading, happy drinking and HAPPY (almost) FALL!